FE Moran continues to expand and provide superior protection against home invasions, fires and thefts. Our team members are passionate about serving the needs of our clients by working to be the best they can be through attentive, focused, and knowledge-based service. Each successful person works hard to reach their full-potential through self-study and company sponsored training. FE Moran Security Solutions, headquartered in Champaign, IL, is one of the nation’s top 50 security companies as ranked by SDM Magazine. Providing advanced security for homes, offices, and enterprises, this rapidly growing company has been serving both residential and commercial needs for over 15 years. FE Moran prides itself on providing innovative life safety and security solutions, high-quality equipment and installations, customized monitoring and unsurpassed customer service. As FE Moran continues to expand and provide superior protection against home invasions, fires and thefts, they are expanding their sales force with experienced, qualified security consultants. Brett Bean, CEO, recently stated, "Our team members are passionate about serving the needs of our clients by working to be the best they can be through attentive, focused, and knowledge-based service. Each successful person works hard to reach their full-potential through self-study and company sponsored training." Over the years, FE Moran Security Solutions has quietly gone about providing outstanding service to its many residential and commercial clients. The company has both the certification and extensive experience needed to fulfill its commitment to its customers. Many consumers are confused about home security. With so many security companies and options available in the marketplace, sifting through the good and the bad can be very time consuming. However, the nuts and bolts of home and commercial security is really quite simple – protecting what matters most to you is the #1 priority! Through 24/7 monitoring, FE Moran Security Solutions is tasked with protecting lives and property and it takes the seriousness of that responsibility to the highest level. 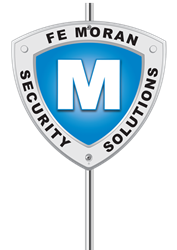 At FE Moran Security Solutions, employees are driven and passionate about the service their company provides and they take an extreme stance when it comes to protecting the safety of their clients and the security of the property they have been entrusted with. FE Moran is committed to the necessary training and education they offer their new sales people and thus ensure a rewarding career with the full opportunity for advancement. Help FE Moran Security Solutions create a more secure world for our clients. Apply Online Today.